The weight of carrying untold truths. The gut punch of riveting Senate testimony this week has caused me to feel and to think about what it costs to carry untold truths inside. Not just me. I believe that every woman listening – those that are able to look inside and to see what’s there-- has remembered her own story. Some are as horrific as Dr. Ford’s. Some are a different sort of story. Histories of being invisible. Histories of expectations. Years of not being able to give voice in any way to experiences. I am almost afraid to see and make comment about our common threads of experience, as if to diminish the frightening life-changing reality of the worst events. I do not mean to be glib. But that common thread is what makes the worst stories so much a part of all of our lives, even if that was not our exact experience. Women’s experiences are connected. Human beings’ experiences are connected. Looking at truth and giving voice to it has costs. Always. And yet, that painful process is the path to being whole. 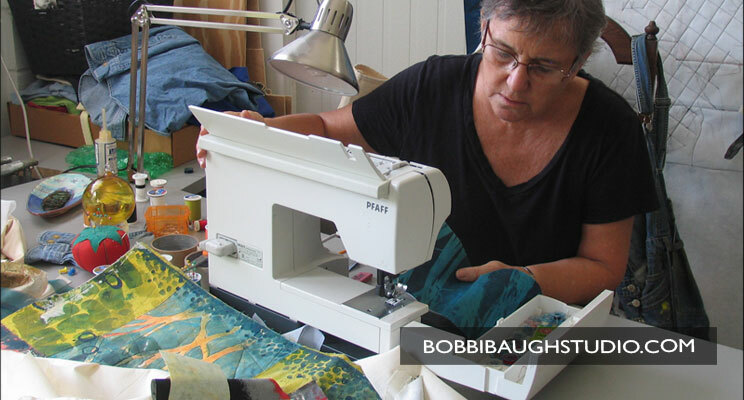 Haven’t you heard this truth of emotional wholeness expressed in the lives of artmakers? So many stories include a process of overcoming. “I always knew there was an expressive being in me, but my work – life – schedule - childhood fears – physical limitations – kept me from making the leap.” And always, overcoming the obstacles is worth the price. We will be hearing more gut-punch revelations in the coming weeks. There will be posturing and pushback and tribal alignments. But at the heart of this is the powerful, undeniable truth that we cannot both carry untold truths inside and be well and whole. Wherever each of us is in this process, my deepest hope is that we will choose to fight the fight. Truth does set you free. I had not looked at this work in awhile. But today I travelled through all the details of it again and remembered why it speaks to me, and why I especially enjoyed the process of creating it. A writer contacted me asking for permission to use this work as a poetry book cover. (How great is that!) It’s an honor to know that she has discovered the work, has taken time to respond to its content and felt drawn to it. 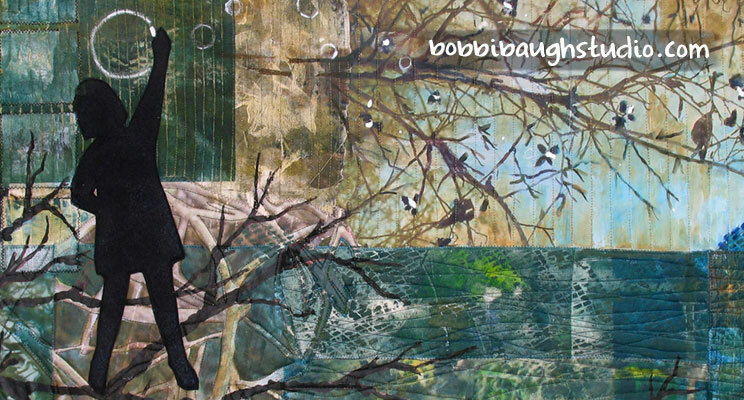 My hope in creating this textile collage was that it would combine a sense of innocence and possibility in the little girl with a complex environment, one that has a lot of layers. To create the complexity of the girl’s world, I combined printed and painted fabrics with original photos that I transferred onto fabric. There are three photo transfer sections, and they all worked differently. Beneath the girl’s feet is a section of complex, overlapping twigs. I am intrigued with the way they seem to suggest underground roots. I used a lot of transparent acrylic wash in this section to define and deepen the root shapes. 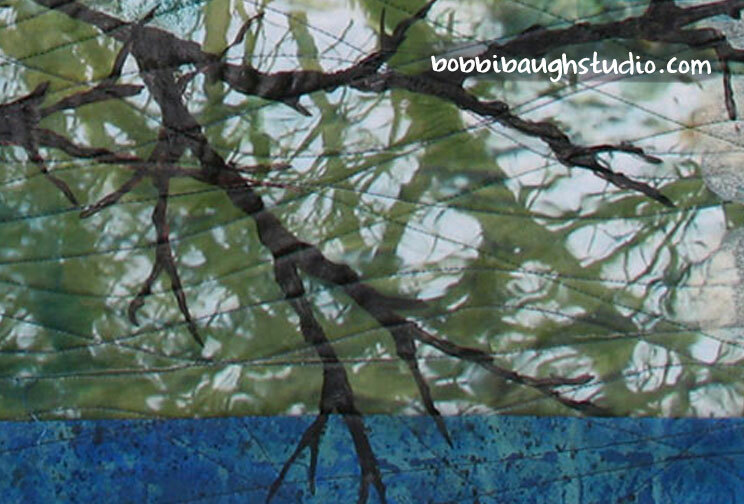 The watery reflections at the lower right came from a photo I took of a pond in Georgia. I did almost nothing to the transfer after getting it on the fabric. The picture came out clearly and I love the sense of mixed reality – trees, but upside down, and rippling, as reflected in the water. The branches at the top right are a third photo transfer. I ended up doing a lot of opaque painting on this part. The white blossom-like shapes are suggested in the photo , and enhanced by direct painting. These white shapes are related to the white circle the girl is drawing. Are they her thoughts that have taken flight? This work has a landscape composition with a strong center horizon line and a clear above-and-below. In the below-ground section, the photo transfers mix with other rich colors and textures. She’s all by herself there on that limb. All around her there’s a lot going on. Just like life. This work is available, and posted on my website HERE. which includes some original poetry, it’s on YouTube, HERE. Good questions don’t close the door. They open it. To look at a thing – a scene – an event, and to ask questions. To wonder what is really going on, and when it began. What an entry into mystery. And, reading, I became caught up in the wonder too. I could imagine foxes dancing. Cats tiptoeing. Small birds almost skating on the surface, leaving just whispers of markings. Who knows what went on by moonlight? I love this quality of poetry. I love the way a poet can begin with a simple observable object or scene and open it up for examination, turn it over to reveal possibilities, then look beyond the thing itself to suggest other deeper meaning. I try to bring this process into my own artmaking. Not living in a snowy place, I am drawn to water, shadows, looking underground, under rocks. I think I’m closest to getting it right when I can create an image leading a viewer to the door of questions. Then living with the work becomes a process of considering possible answers. 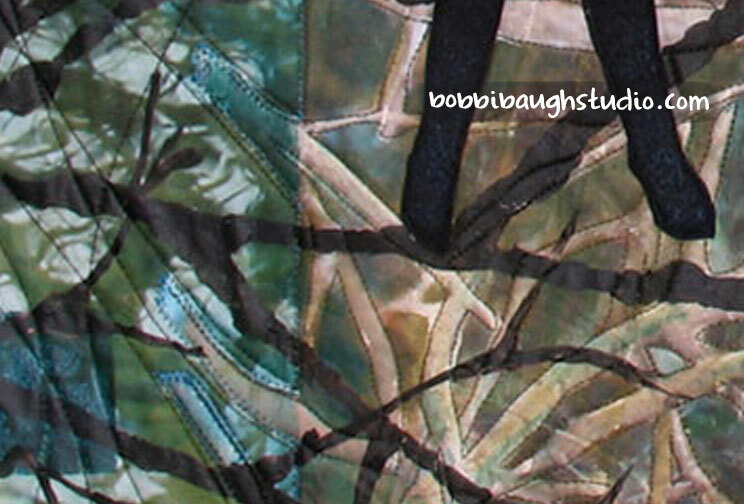 This morning in the studio I was sewing on a new art quilt with NPR news on in the background. As I stitched, I thought what a strange juxtaposition this was. Here, in my self-contained world, in a room in which I have a fair amount of control over outcomes, I am creating. Meanwhile, stories that are big and important, over which I have very little control are unfolding and being reported. Meaningful immigration debate has evaporated – at last for now – in a slew of ugly, racist words by the President. Other countries are reacting. A US ambassador has quit in protest. And the list of important issues facing our country remains a large stack of untouched “to-do’s” in the congressional inbox. And I am merrily sewing along. Each of us, as we go about our chosen work, is faced with this same juxtaposition and decisions about what to do. After setting up this situation, I realize, of course, that I have no magic answer or prescription to offer. Living in a complex world is hard. Living in a country that allows tremendous freedoms along with tremendous responsibilities is hard. It is tempting to retreat entirely into the bubble of what I can control or what I enjoy. But it’s not a solution that would be right for me. Living so deeply in the world of external events that I become unable to create artwork would also not be right for me. For now, I do what I believe most caring, thoughtful citizens do. I engage in the greater world to the best of my ability: as a volunteer, a giver of what money I can donate, a voter. And I continue to create work that is meaningful to me. Is it enough? I feel the need to keep asking that question. To see what you can see. To discover what you would have missed. To avoid the maddening traffic and congestion of an Interstate highway. All are good enough reasons. And sometimes, as in my recent drive through rural South Carolina over Christmas vacation, there will be a rare gem. 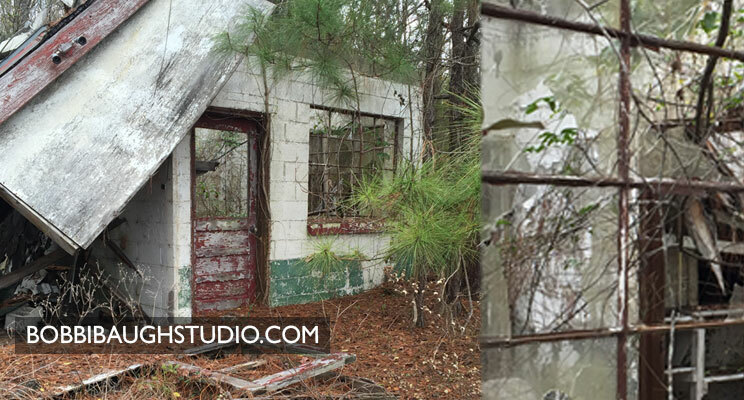 There by the side of the road, tucked back among pines, I found this abandoned home. Those words are the stuff of storytelling. Why was it abandoned, and by whom? How long has it stood in this form? In what stages has it fallen apart? My crunching steps in the thick pine needles were the only sounds in that still place. Like most of the roads we travelled on this trip this one had very few cars and no trucks. Houses are my artmaking focus this year. The simple shape of a rectangle plus a triangle for a roof contains lifetimes of memories and associations. The simplest drawing made by a child, showing a house with a little family beside it or in it, is rich with meaning. The outside of a house and the world it contains can be very different. And windows are wonderful points of entry from the outside to the life within. I was stirred in m own memories standing in the quiet place by this house, this structure that used to be somebody’s home. 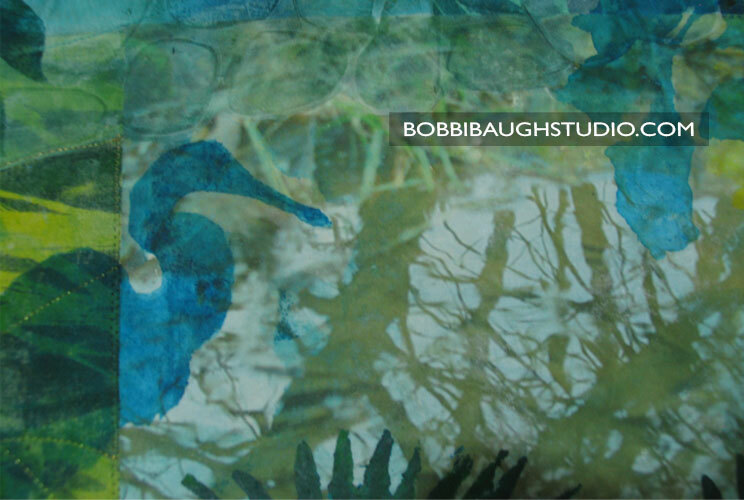 My photos will be a way to remember, as well as a source of images to transfer to fabric and incorporate in my collaged work. Our South-Carolina to Florida trip took at least three hours longer than the most direct driving route. For me, it was a good use of time. The motion called to my attention. On the lawn, something happening. Staccato motions, flurries of dark spots. A horizontal slice of life beyond. So close… oh they were so close! 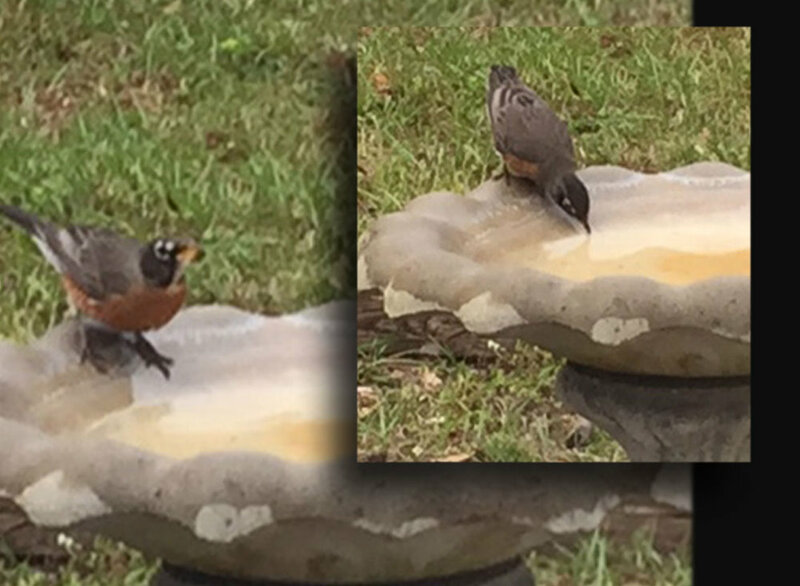 Miss “I-was-here-first-in-the-birdbath” and you just better get on your way. Miss “C’mon-it’s-my-turn-now” and I’m just going to flutter my way right in there. Did I say how close they were? So close. Close enough to see the brightness of their eyes. Where do they hide the hours when not in my birdbath? How did they choose this yard, our yard, to be their landing place today? 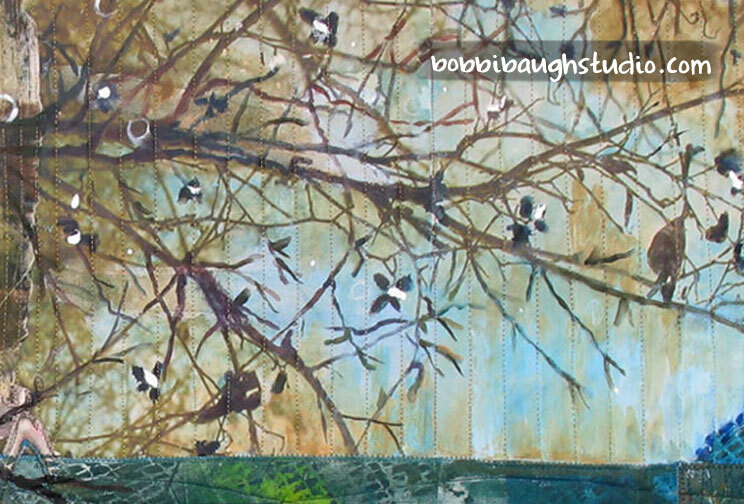 of giving voice to musings on little birds. And stopped. Took Time. Watched. Saw. Did I say how close they were? As I sat by my booth at the Arts in the Park Festival in Blueridge Georgia last weekend, I thought I felt somebody’s breath on my neck. I felt her little presence. So I turned my head slowly. “Hello” we each said. Barely five years old was my guess, and we never exchanged names. She is an artist too. She told me. Watching me practice sketch with some loose left-hand quickies, she thought my art looked a little funny. “Well, how about the finished pieces I have hanging in my booth. Do you like those?” Like a good critic, she took her time looking them over. (Although most critics do not add pirouettes and twisting dance moves as she did.) “Yes.” She said my work was nice. I asked her which one had her favorite color. This was a big decision, because her favorite color is turquoise… no, red…. no, yellow. She has a number of favorites. Finally she pointed to what she liked most in my work, and came back over to my sketchbook. She said she liked to draw too. So, of course, I handed her the pen. Right next to my work she added hers — with a little coaching. She said she didn’t draw humans very well. So I suggested she start with just a head. That made sense. Then I suggested adding a body. And some legs. And she did. Then her Dad reappeared from his visit to the booth next to mine: a chance to show her work and explain about the art we’d been making. So much good in such a short encounter. My memory of her sweetness. Her confidence. Her little dance. That she knows of wonder. That she likes to create. I have thought of her all week, wishing stars and stars for her. Earlier this year I worked my way through a series combining landscapes with a dream-journey quality. I returned to my sketchbook frequently, seeing what ideas reappeared over time and how they changed. And I took my well-worn copy of Robert Frost poems with me on the way. I love his attention to observed detail, and apparent surface simplicity layered over well-considered ideas. “Now Let the Night Be,” was created from this process. The title “Now let the Night Be” is a line from one of Robert Frost’s poems. His simple iambic rhythms evoke a sense of time and process. It helps me to create when I feed my soul with words from authors and poets who stir up thoughts. I printed and collaged sheer fabrics to create a misty, dream-like landscape. Tree forms are both solid and ethereal. The arch suggests an invitation to enter, or a journey about to begin. Opaque printed muslin pieces with stitched texture and heavy rock forms provide a grounding for the dream. The bird as a symbol has appeared in other works in this series. Like a young girl, birds are fragile. Their footing can seem tenuous. And, as in folk tales and stories, the bird can be a messenger and guide. I placed this bird in the branches with the girl and then partially hid her through subtle coloring. . Like messages themselves: sometimes hidden. But present if you are quiet. And patient. And open. Sunday morning. Blueberries inside the pancakes. Simmered peaches on top of the pancakes. Slanted sun on the porch. Mozart playing. The pleasure of seeing it all come together—the sizzle of poured batter, the bubbles in the cooking cakes. So good when they don’t stick to the pan! (“Is this heaven,” the stranger asked? Naw. It’s just Iowa.) Amen.